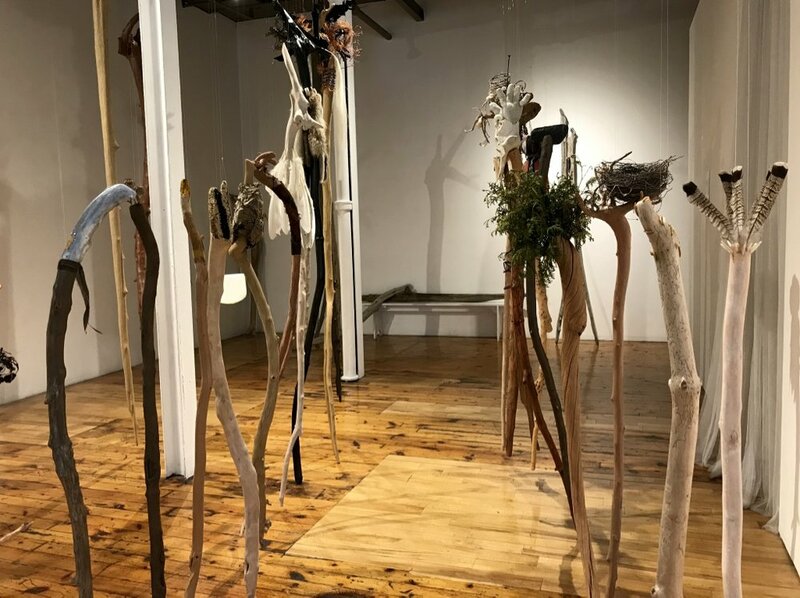 Upon entering the gallery, you will encounter a total of sixty-four driftwood tree trunks and branches of varying sizes floating before you. First, you will be drawn into a channel of driftwoods, twelve on either side. Each bears some form of natural element, a reminder of the goodness our earth offers when we live with respect for it and our neighbours. Cultures around the world have practiced earthly celebrations for millennia, but in our fast-paced lifestyles in cities, surrounded by buildings, we are less connected to nature which can get lost in the metropolises. My journey to this sculptural installation comes from my history of long walks in nature. The distinctive forms I see sharpen my awareness about whatever I’m working on at the time. Mostly my collections of flotsam wash onto the beaches I have been living by. I am always interested in what oceans or lakes deposit on the shore each day. 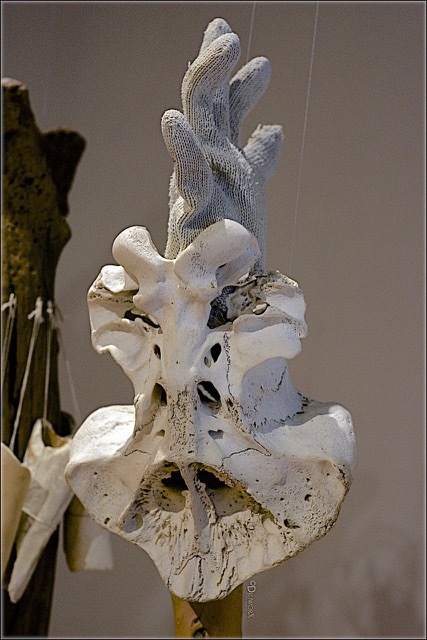 Driftwood especially, is hauntingly beautiful, often suggesting animal and human forms. It’s difficult to miss the metaphor in today’s world where millions of people are cast out and thrown adrift by wars and growing scarcity due to a number of politically driven problems including climate change. Since Systems Failure, my last Red Head Gallery exhibition in September 2016, many important political changes have taken place, further destabilizing the people from the political forces that be. ...Eventually you will come to a circle of twelve, ten-foot high driftwood sentinels, symbolic of the world at large. They are facing each other in acknowledgment of our human strengths and weaknesses. Facing them from the centre of this circle stand twelve walking cane sized driftwood sticks representing different forms of modern slavery, also asking for acknowledgment and help. Daily we are reminded by news reports about the growing disparity between the haves and have-nots, inadequate living wages, human trafficking, suffering and shortened life-spans. Those that have, have lifestyles that are dependent on the suffering of others. What does this say about us? Perhaps the discomfort we feel when confronted by this is necessary. Often times we catch ourselves unaware. I was surprised to learn about how many “slaves I had” working for me. A friend had sent me a website called Slavery Footprint and what it revealed inspired me. I took in just by clicking on the different categories of things I own, eat, or wear that these items have a slavery footprint. Awareness inspires movement toward change. Since Toronto has become such a culturally diverse city this is a great opportunity to hear from the people about what matters to you. 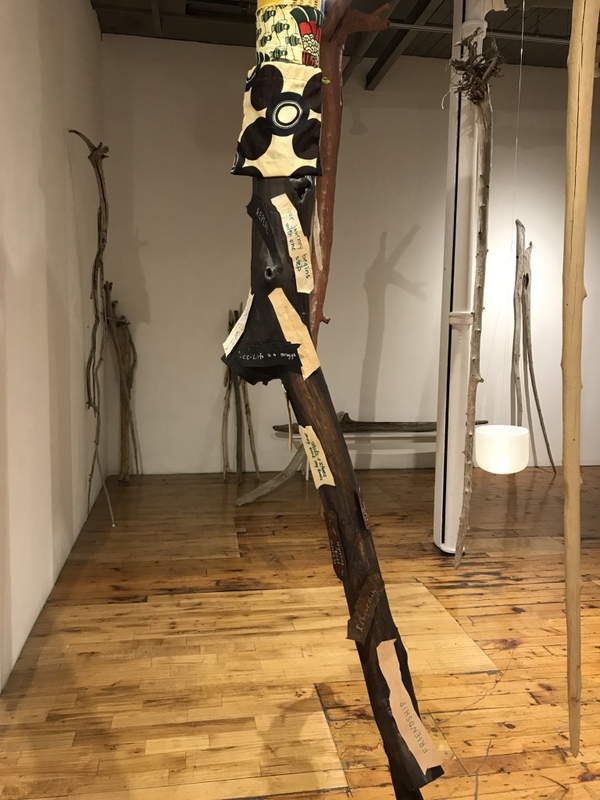 I invite every visitor to the gallery to share your views and symbols by writing on the bark-inspired papers provided and placing them on the tree trunk which best represents you. So please, spread the word; bring your friends and colleagues. Our crucial (lifestyles) decisions bring us to another Crossroads. Clemence and Ryan Hirons met and married in Rwanda while both were working for an NGO. Clemence survived the Rwandan genocide as a child. Merike Lugus is a published writer and visual artist, with a Master’s degree in Sociology from U of T. She came to Canada as a refugee from Estonia from WWII. 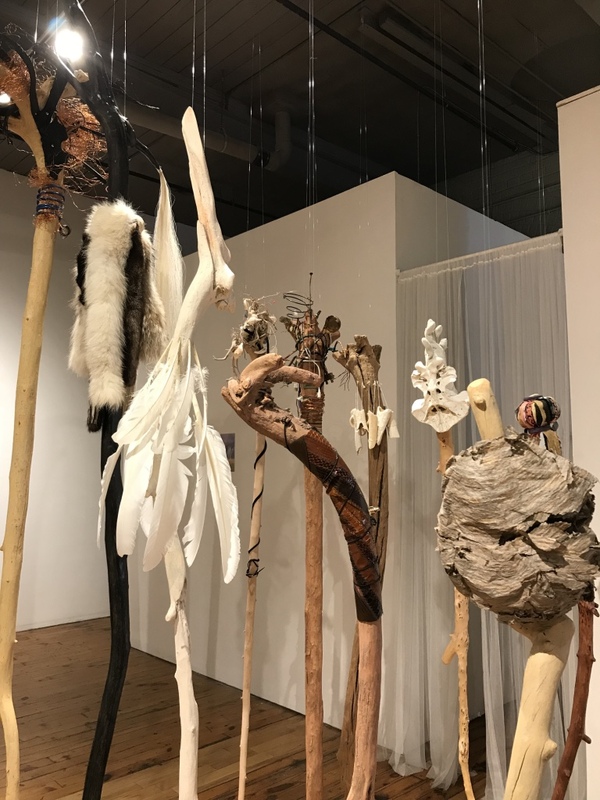 William Woodworth/Raweno:kwas is an adjunct professor at the University of Waterloo School of Architecture where he teaches native culture and architecture. He has a doctorate in Traditional Knowledge from the California Institute of Integral Studies in San Francisco. Summi Siddiqui is a world traveler who connects cultures and people with her stories. Ming Hoffner came from Zhejiang China in 2002. She has been in Canada for 16 years. Ming is an ECE working in the kindergarten for the Toronto Catholic District School Board. She originally came to Canada to unite with her husband whom she married in China. She will speak about her struggles to learn the language and culture and find her place here. Maralynn Cherry is a visual artist of Odawa and British heritage. She is a writer and independent curator who taught for 14 years in Cultural Studies at Trent University. She was the curator at the Visual Arts Centre of Clarington for seven years, deciding to leave in the spring of 2012, devoting more time to her studio practice.